Have you ever turned over a slice of roast beef and caught that glimmer? A hint of rainbow iridescence that’s a little otherworldly for what’s an otherwise run-of-the-mill cold cut? Even when fresh, some sliced meats give off a metallic sheen that can give you pause. But what you’re seeing is the common optical phenomenon of interference, not the sign of rancid putrefaction. Unless your meat is starting to smell or that rainbow of colors is accompanied by some fuzzy growing microbes, your lunchmeat is safe to eat. Optical interference happens whenever a light wave reflected off one surface encounters a wave reflected off another surface close by. When these waves overlap, we see only the resulting sum. If two waves are in-phase—that is, if the peaks line up with the peaks, and the troughs line up with the troughs—then the sum is a bigger wave, called constructive interference. If two waves are out-of-phase—peaks lined up with troughs—then the sum is a complete cancelation, called destructive interference. In the case of lunchmeat, two sorts of interference effects are possible. The first is called thin-film interference. Some deli cuts, especially cured meats, are rich in fat and oil. If this fat seeps out, it can form a layer on the surface and change the situation from a simple single reflection to a double reflection—one off the front surface where the air meets the fat layer and another off the back surface where the fat layer meets the meat. Since the fat layer is thin, this tiny difference in the distance means that the two reflected waves are out-of-phase; the position of the peaks in the wave that had to go further is shifted compared to the one that didn’t. When waves are out-of-phase, they cancel and the light disappears. However, while this is true for most of the light going through the thin layer, there may be a few select wavelengths of light where the distance traveled through the film and back is exactly right to keep the front and rear reflections in-phase. Those select colors don’t get canceled, and so they become the only colors we see. This type of interference is what gives oil slicks their hues of purple and green, and what gives bubbles that warbling rainbow shimmer. These films, just like the fat slick on a slice of ham, have thicknesses of only a couple micrometers (comparable to the wavelengths of light, and about 50 times smaller than the width of a human hair) meaning that we often have layers that are just a few dozen molecules thick. Take a few fat blobs away from one spot and pile them up somewhere else and the thickness changes enough to alter the wavelength that will fit the constructive interference condition in that spot. The “rainbow” that you see, then, is the gradual shift from one dominant color to another as the thickness varies. The second interference effect is called diffraction. Diffraction occurs whenever light passes through a repeating grid of equally-spaced slits or bounces off a surface of equally-spaced reflectors. This structure—called a diffraction grating—produces many reflection points, meaning that instead of considering how just two reflected waves interfere, we must consider the sum of a great multiplicity. In such a case, the intensity of nearly all wavelengths are not just lessened, but completely extinguished; the colors which interfere constructively become very sharply defined. You’ve seen this effect if you’ve even watched light play off the grooves in a CD or DVD. Unlike the gradual undulations of an oil slick, you see a brilliant kaleidoscope spinning through all the colors of the spectrum as you tilt the disc. What does this have to do with lunchmeat? Muscles are made up of proteins that bind into strands, and these strands in turn group into long fibers, each about one or two micrometers in diameter. These building blocks are repeated over and over within a single muscle, and the body can contract some or all of these fibers in concert as it moves. When a muscle is cooked and ultimately cut, this repeating structure of muscle fiber is exposed, forming a natural diffraction grating for visible light. Any mixture of light incident on the slice of meat will encounter these well-ordered fibers and reflect only certain colors out at certain angles. Scientists, in fact, measure the angles at which different colors of light diffract off different types of muscle fiber in order to study the structure and size of those muscle groups. Not all lunchmeat shimmers, though. The rainbow effect is easiest to see on darker meats where the contrast is greater, like roast beef or ham. It is also most visible on meat sliced from whole muscle—and only when cut against the grain—that preserves the natural periodicity of the muscle fibers. “Restructured” or processed meats like deli turkey or bologna are made by binding together and reshaping separate smaller pieces of meat. In that process, all muscle fiber order is lost, and furthermore, the binding agents tend to plug up any gaps between fibers that survive, further reducing the periodicity and structure of the grating. The effect is also rarely seen in raw meat. Though the fibers in the raw muscle are well defined, they are smaller and looser, meaning they can’t hold the rigid shape needed for diffraction. Once the meat has been cooked or cured, the fibers tighten, enhancing the grating effect. Also, fibers that absorb salt during cooking will retain more moisture and swell, preserving that essential repeated structure. Though rainbow meat looks suspicious, there’s nothing wrong with it. 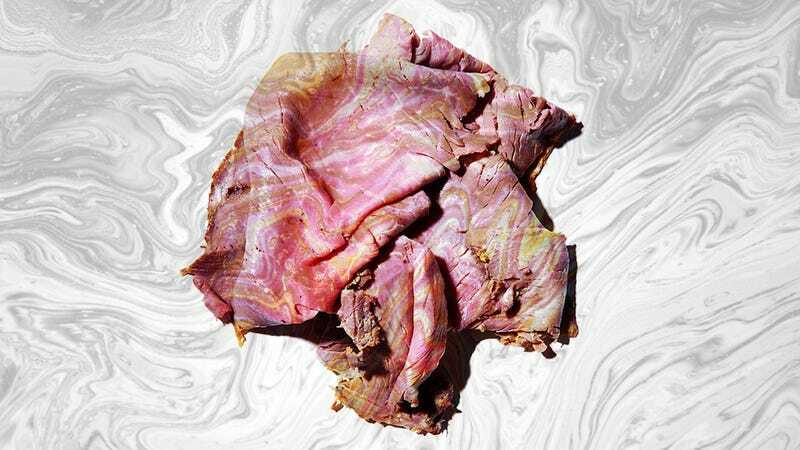 That metallic sheen is just an optical trick that that affects the looks but not the taste or safety of your lunchmeat. Pile on another layer of corned beef and eat up.